With two boats, a liter of water and a handful of ash, the Freedom Flotilla created a diplomatic incident that shined a light on Indonesia's occupation of West Papua. Buzzacott spoke of a source in the north, on the border between West Papua and Papua New Guinea, that sends water surging thousands of kilometers south through a network of subterranean capillaries that later springs up in the desert. “This water has come to the Arabana people as a blessing from the land of the Papuans,” said Buzzacott, an Aboriginal elder from Lake Eyre. “I want to take it back to the people of West Papua and say thank you,” said Buzzacott. 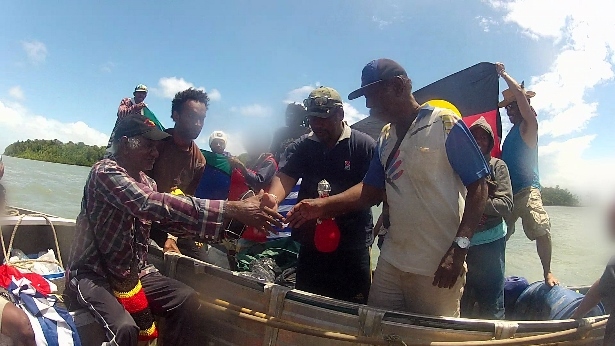 But to take the water back to West Papua involved an act of courage and defiance. 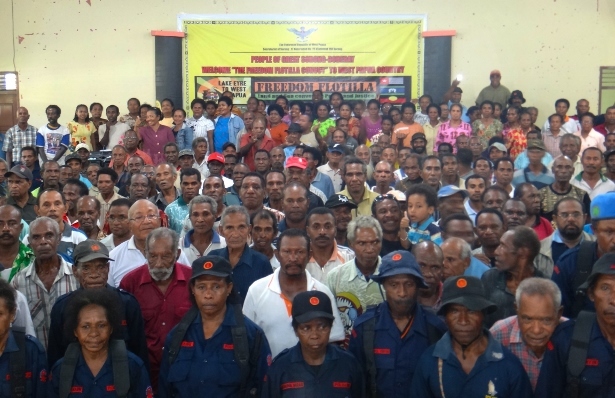 This risky venture, an initiative of indigenous Australian Aboriginal elders and West Papuan refugees, was designed to build solidarity and shine a light on the Indonesian government’s ongoing occupation of West Papua. It was also a creative experiment employing ritual and ceremony as a form of third-party nonviolent intervention. When I met the activists in Brisbane, the Indonesian government had not only refused the group permission to conduct a “cultural exchange” in West Papua, they had readied their air force, three naval patrol boats and sent thousands of troops to the south of the country to thwart the flotilla. Bob Carr, Australia’s foreign minister at the time, threatened that the Australian citizens on board would not receive any consular assistance in the event they were arrested by the Indonesian authorities. “Push” might be putting it too mildly. When the Indonesian government refused the activists entry, the organizers of the flotilla issued their own Aboriginal “passports” and West Papuan “visas” in a symbolic challenge to state-centric notions of sovereignty. The flotilla activists spoke openly about the need for human rights monitoring in West Papua and the West Papuans’ right to independence. Back around the campfire in Brisbane, Buzzacott spoke about how Aboriginal people, Torres Strait Islanders, Papua New Guineans and West Papuans were once united. His is a longer view reaching back to the last ice age more than 10,000 years ago when Australia and New Guinea were connected by a land bridge. He spoke of the shared flora and fauna — the kangaroo, cassowary, cuscus and echidna — as well as the shared stories and long forgotten ceremonies that once connected the “bow and arrow” people with the “woomera people,” a tool used by Aboriginal people to extend the range and velocity of the spear. He then reached down into a bag and pulled out some ash collected from various Aboriginal tent embassies around Australia. He placed ash on our skin and poured water over our hands, symbols of peace and recognition of our connection to the earth. He spoke of love, music and the healing power of fire — of campfires where stories have been told for over 50,000 years. Buzzacott then told his own story about meeting Jacob Rumbiak 10 years ago. Rumbiak, a senior West Papuan leader and former political prisoner living in exile in Australia, told Buzzacott how the West Papuans were facing slow motion genocide. Rumbiak’s story resonated with Buzzacott. He was shocked and disturbed to hear that colonialism was still continuing; that violent racism is still a reality — that the West Papuans face helicopter gunships, arrest and torture by the Indonesian army and police simply for wanting to be free — and that the influx of Indonesian migrants is turning indigenous West Papuans into a minority in their own land. As he and Rumbiak’s friendship grew, the idea of the Freedom Flotilla, a voyage of indigenous solidarity, took root. Uncle Kev, as he is affectionately known by the activists, is not the only one who yearns to re-establish connections. In a movement that historically has been riven by disunity, the vision of reuniting ancient ties and diverse tribes strikes a chord with West Papuan activists from inside the country as well. West Papuan activist Silas, whose name has been changed to protect his identity, told me that his people, the Malind Anim who live in the vast savannah in the southern part of West Papua, speak of the Malkai, the people of Papua New Guinea and the Torres Strait, as relatives. He recounted when cultural exchanges took place between the Malind Anim, the Malkai, and Aboriginal and Torres Strait Islander peoples from Australia at the turn of the 20th century. These ancient exchanges may have been interrupted by the vagaries of colonialism but the links forged by them are still sung about in song. He wants to reawaken these connections and harness the energy of solidarity to propel his country to freedom. After leaving Brisbane the flotilla headed north to Cairns. The planned itinerary was to hug the coast to the Torres Strait Islands, an archipelago administered by Australia and situated between the Australian mainland and Papua New Guinea. Papua New Guinea is an independent democratic state situated on the eastern half of the island of New Guinea. The western half of the island of New Guinea is West Papua, which has been occupied by the Indonesian government since 1963. From Horn Island in the Torres Strait the boats then planned to travel to Merauke, on the southern coast of West Papua. The entire distance from Cairns to Merauke is approximately 900 nautical miles. 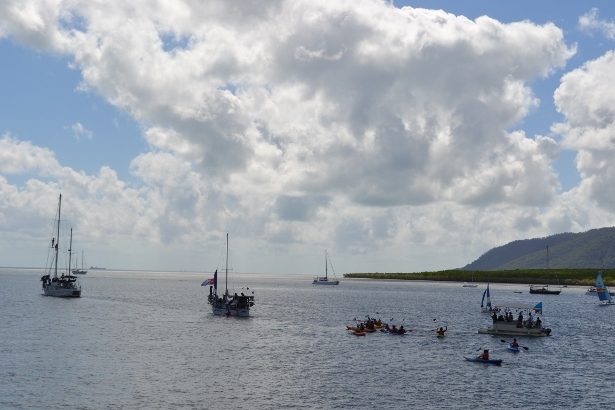 On August 17, Indonesia’s Independence Day, the flotilla departed Cairns. Around the same time Ronny Kareni traveled to Vanuatu to elicit support for the Papuan cause from the five Melanesian countries, Papua New Guinea, Solomon Islands, Fiji, Kanaky (also known as New Caledonia, a colony of France) and Vanuatu. The Indonesian government was not impressed. Instead of celebrating the country’s achievements, news about Indonesian Independence Day was dominated by the flotilla’s impeding arrival, how Indonesia intended to respond, ongoing human rights violations in West Papua — home to Indonesia’s longest running separatist conflict — and why the Indonesian government continues to ban foreign media from traveling to the territory. The flotilla catalyzed news stories in places as far away as Ghana and mesmerized people across the Pacific. In response the Indonesian government urged the Australian government to stop the flotilla. While Carr lambasted the members of the flotilla in the media, in the end the Australian government failed to do anything of substance. The only thing the Australian Foreign Ministry did was write a mild letter to Isabella Brown, one of the organizers, pointing out that their actions were “high risk” and advising the participants in the flotilla to avail themselves of the Australian Department of Foreign Affairs’ online travel advice service. It was the diplomatic equivalent of a green light. The Indonesian government’s ire also failed to raise any reaction from the Papua New Guinean government. The flotilla sailed within sight of Papua New Guinea but their government did not respond. Privately, members of the government told Kareni, who had also traveled to Papua New Guinea to organize support, that they supported what he and the flotilla members were doing. Before the flotilla left Horn Island in the Torres Strait bound for West Papua they held a press conference. The West Papuans and organizers of the flotilla knew what they were doing was dangerous. By the time the group had arrived in the Torres Strait, four West Papuans inside the country had already been arrested by the Indonesian police and charged with treason, which could result in 20-year prison sentences, simply for organizing a church service to pray for safe passage for the flotilla. Despite this repression, West Papuan activists inside the country urged the flotilla to continue with their journey. Jacob Rumbiak, Kevin Buzzacott, Ronny Kareni, Isabella Brown, and Amos Wainggai — a West Papuan activist and former refugee — told the press what was by then global news: One of the boats, the Pog, would continue to travel to West Papua while the other boat, Trudy, returned to mainland Australia because the safety of those on board could not be guaranteed. The activists reiterated their desire to open a dialogue with the Indonesian authorities about their intentions and advised the growing network of supporters on how they could track the flotilla’s position via the flotilla’s website. A pulsating light showed the Pog tracking towards West Papua, however, the organizers concealed part of their real plan from the public. On September 12, the cultural exchange took place in two small aluminum dinghies at a secret location just off the coast of West Papua. Several Malind Anim from Merauke were there. Also present was Yacob Mandobayan, a young man who would later be forced to flee for his life along with six others, including a pregnant woman and a child, after the Indonesian security forces conducted house-to-house searches for flotilla organizers. Also representing the West Papuans were Elieser Awom, a former political prisoner and now Minister of Defense for the National Federal Republic of West Papua, a coalition of West Papua resistance groups who supported the flotilla, and Frans Kapissa, a university lecturer. The ceremony was captured on video and circulated around West Papua. As the sacred water and ash was exchanged Kapissa thanked the members of the flotilla. “This ancient tie between Aboriginal peoples and us that was broken has been restored. We hope that your support will continue for always.” Buzzacott, speaking through tears told the West Papuans that “we are going to struggle all the way.” As the two boats pulled away at the conclusion of the cultural exchange the cry of “Papua Merdeka,” or Free West Papua, rang out across the waters. In West Papua grievances have gone unaddressed for decades. Under the current Indonesian President Susilo Bambang Yudhuyono state violence in West Papua has festered. Yudhuyono’s approach in West Papua has been to ignore or deny the problem. Nonviolent attempts by West Papuans to express their aspirations for independence have been criminalized. The conflict and violence in West Papua has to become an international problem before the international community can be expected to take action. The West Papua Freedom Flotilla has made a valuable contribution to that process, particularly in Melanesia, a sub-region of the vast Pacific. Shortly after the flotilla concluded the Prime Minister of Vanuatu, Moana Carcasses Kalosil, spoke in support of international action for West Papua at the United Nations General Assembly. The West Papua Freedom Flotilla posed a dilemma for both the Australian and Indonesian governments. If they did nothing the flotilla would reinvigorate solidarity in the region. If they responded violently or threatened violence, as the Indonesian government ended up doing, they would expose the reality of the occupation and the suppression of the Papuans’ right to freedom of expression. By publicly putting their bodies on the line and maintaining strict nonviolent discipline the flotilla activists created a win-win situation for the movement, although not one without costs. These personal costs, however, are ones the West Papuans are increasingly willing to pay. “We need to take action otherwise we will disappear. In 20 years our people will be less than 30 percent of the population. We are dying under the barrel of a gun,” Kareni told me. This is not rhetoric. According to Dr. James Elmslie, in the 1960s West Papuans made up 96 percent of the population of West Papua. Currently their numbers are less than 50 percent. Of course there are also lessons learned. There could have been more preparation and training in nonviolent action; more contingency planning about how to support activists involved in the flotilla inside the country; greater representation from other resistance groups and from different parts of Papuan society; and a willingness to follow through and illegally enter West Papua, thereby bringing the flotilla to a dramatic climax. Importantly, the activists also could have avoided talking about independence in order to attract even greater third party support. Wow. What a read. Great work and large thanks Jason for such an outstanding article. Great article. We urge readers to follow up by supporting freedom for West Papua political prisoners! Please sign the petition initiated by the daughter of Filep Karma, imprisoned for 15 years for waving a flag. Thanks for this report, Jason. Very informative and the kind of news we don’t get from our Philly mainstream press. Great article about a courageous and powerful action challenging the Indonesian government’s severe repression of human rights and democracy activists in West Papua.